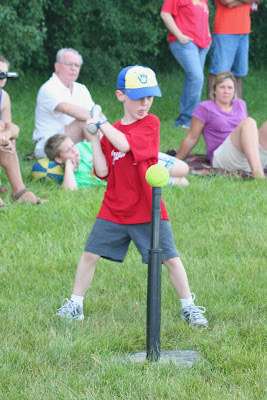 Tonight is T-ball! 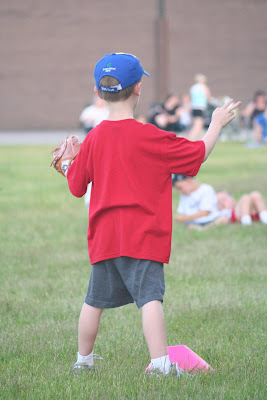 I don't know if you've heard, but Jack has an obsession for baseball (I'd call it mildly unhealthy)...he watches TONS of Brewers games, knows everything about the game and plays outside every chance he gets (just ask our neighbors who are constantly throwing balls back over the fence). 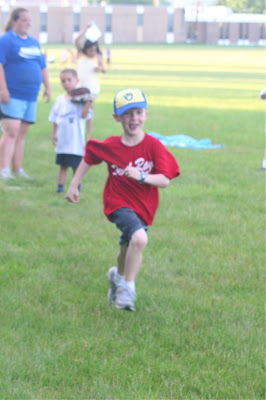 So, he was beside himself to start t-ball this summer and really does love it. I on the other hand am SO BORED! It's a very PC game...everyone hits each inning, no one can be "out" (in fact they always through the ball home)...basically no skills are needed/taught. Fine for this year, but I think next year Jack may hate every second of it! Hopefully it won't turn him off too much. Anyway, the best part is that Jack's team is made up of about 6-7 friends from school, so he is still getting to hang out & play with his friends every week too! So...seeing as I haven't posted pics in a couple days (and I'm alone with the girls tonight so no new pics will be taken), I give you pics from a couple weeks ago. 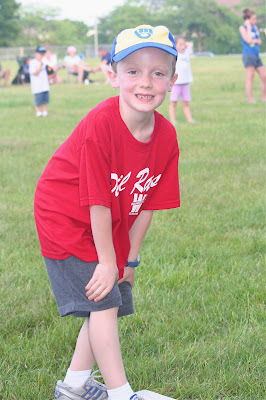 I believe it was about 90-95 degrees that night but Jack still gave it everything he had (thanks to Mike & Lisa for the water bottle...what Mom forgets that on the hottest night of the summer?). love that he bats with his tongue out! like I said...no outs, yet they still run like they're on fire! nice pictures. i feel like all meyer does at these games is pick grass. that's awesome.